GW Pharmaceuticals plc (Nasdaq: GWPH, “GW,” “the Company” or “the Group”), a biopharmaceutical company focused on discovering, developing and commercializing novel therapeutics from its proprietary cannabinoid product platform, along with its U.S. subsidiary Greenwich Biosciences, announced today that EPIDIOLEX®(cannabidiol) oral solution has been transferred to Schedule V, the lowest restriction classification, by the U.S. Drug Enforcement Administration (DEA). 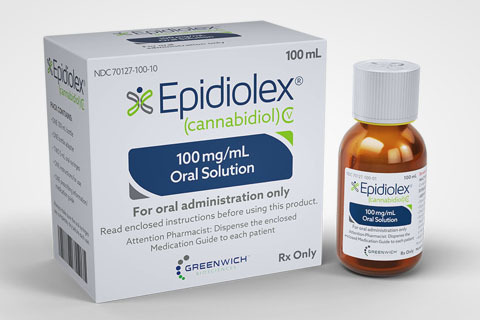 EPIDIOLEX, which was approved by the U.S. Food and Drug Administration (FDA) on June 25, 2018 for the treatment of seizures associated with Lennox-Gastaut syndrome (LGS) or Dravet syndrome in patients two years of age or older, is the first prescription pharmaceutical formulation of highly-purified, plant-derived cannabidiol (CBD), a cannabinoid lacking the high associated with marijuana, and the first in a new category of anti-epileptic drugs (AEDs). With this decision, the product label for EPIDIOLEX will be finalized. The Company’s development program represents the only well-controlled clinical evaluation of a cannabinoid medication for patients with LGS and Dravet syndrome. Both diseases, which develop in childhood, are rare, severe forms of epilepsy that are notoriously treatment-resistant., Most patients with LGS and Dravet syndrome require multiple seizure medications and the majority are resistant to currently approved AEDs.2,, The day-to-day impact of these conditions is significant with high rates of early mortality., The Company anticipates making EPIDIOLEX available within the next six weeks. Availability is primarily dependent on the time involved in obtaining the required Schedule V licenses for the U.S. distributor and importer. Medicines in Schedule V have a proven medical use and low potential for abuse. DEA’s decision to move EPIDIOLEX to Schedule V was based on non-clinical and clinical data that evaluated the medicine’s potential for abuse and applies only to CBD products approved by the FDA. Other, non-FDA-approved CBD preparations remain in Schedule I. Some examples of Schedule V drugs are cough preparations such as Robitussin AC, and a number of commonly prescribed anti-epilepsy drugs such as VIMPAT (lacosamide), BRIVIACT (brivaracetam), and Lyrica (pregabalin). We are a nonprofit educational and scientific society of qualified physicians and other professionals dedicated to the promotion, protection and support of cannabis for medical use. We welcome physicians and allied professionals employing medical cannabis in patient care to become members. © 2019 Society of Cannabis Clinicians.